A couple of weekends ago we went to Camber Sands, for a bike ride and to have a sit by the sea. I got restless, so I dug a big hole, then someone said, why don’t we bury you in it. So I let them. It was so weird. 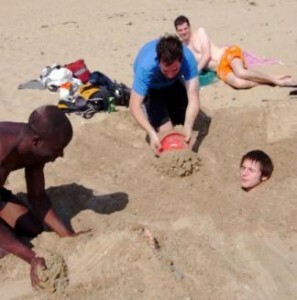 I don’t think I’ve ever been buried in the sand. I felt the weight of the sand pushing down on my lungs, it was a little bit scary but awesome. Then, I couldn’t get out. It was just too heavy. You should try it, it’s good! A week or so before that, my family went on a track day (where you go to a racetrack and try out super fast cars.) for my Dad’s birthday. We had a go in a Porsche 911, a Caterham Superlight, a Jaguar XKR and a surprisingly fun Renault Clio. Actually the Clio was the only one I didn’t manage to spin off out of control into the grass with. But I’m still alive. This entry was posted in London on 23/08/2009 by marek.